I love how this show manages to quickly shift genres, from farce to tragedy, without feeling forced. Constellations turns on the many-worlds interpretation of quantum mechanics, which suggests that a potentially infinite number of parallel universes exist simultanteously. British playwright Nick Payne has applied this brain-teasing idea to the most basic of stories, a love story. It all starts out quite comically, showing how this relationship doesn’t get started in several universes, as one or the other of the couple is married, or expresses no interest in getting together. In a decidedly non-linear fashion, we build to an extended tragic scene in which the couple faces disease and mortality. And then we end up with what is perhaps the most sweetly romantic of the scenes. This flexibility makes for a very satisfying evening of theatre, giving us a more that usual portion of the things we look for in stories. 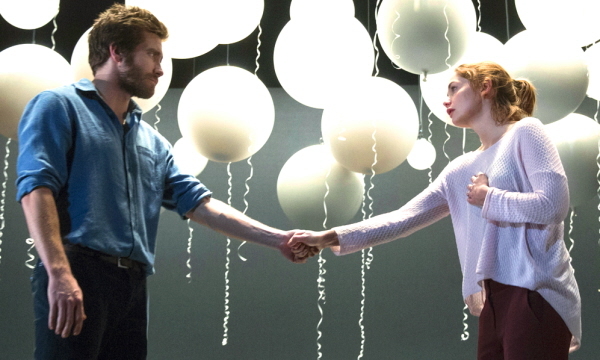 Ruth Wilson and Jake Gyllenhaal play the lovers at the heart of this puzzle, and both prove to have impressive stage chops. They enchant with their easy chemistry, and impress by conquering the sheer technical difficulty of executing subtle but revealing shifts in an often repetative and circular script. Plus, Gyllenhaal has an English accent every bit as solid as his sister Maggie’s in the BBC mini-series The Honourable Woman. Scenic designer Tom Scutt keeps it simple but evocative. The stage is bare of furniture or large set pieces, it’s populated only by an extensive collection of white balloons of various sizes, which, depending on how lighting designer Lee Curran frames them, suggest subatomic particles, neurons, lamps, planets or whole universes. Director Michael Longhurst manages the complex proceedings with great precision and clarity. Highly recommended.